This was originally posted by me at http://blackanddarknight.wordpress.com (no longer available) on October 22, 2012. Last year, I struck gold, and I posted my most popular posts of all time – Index Card Outlines, Part 1 & Part 2. Someone “stumbled” it, and I’ve been getting hits on it regularly ever since. I will admit, last year’s outline was EPIC. Epic as in the sense that I think I had close to a hundred cards, not detailing individual scenes, but individual plot points, and my local NaNo group was in awe of my color-coded pile of paper and dubbed me the next Robert Jordan when the first three cards turned into 50,000 words last November. I thought I was going to make it through most of the outline. Hah. This year, I’ve discovered the beauty of index card outlines – they are so very FLEXIBLE. My NaNoWriMo novel (The Undoing Chronicles) this year will be a fantasy political-thriller/romance. Yeah, that’s a lot. We’re talking genocide, cultural revolution, secret affairs, and marriages that are falling apart. In a made-up world. Am I in over my head yet? Just maybe. Plus, I’m going to be trying something new with the timeline. I’ll get into that in a minute. Let’s start with a picture . . .
On the left, you’ll see some mini character bios. These are the minor characters that will play a role in the plot, but that I didn’t need to do full character bios like I’ve already done for the rest. These are just little things that I need to know off the top of my head. And yes, they’re all Taphim & Zareja’s children. You might like this post, too: Amtrak Residency - Too Good to be True? 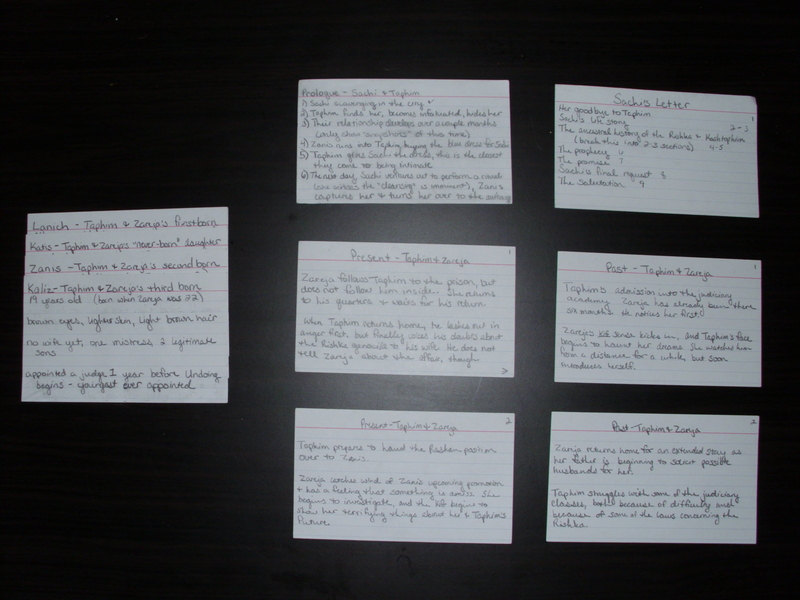 The actual outline begins on the right side of the photo, the six cards laid out like a grid. Starting in the upper left hand corner, we have the prologue. This prologue is going to be long. I’ve already come to terms with it. I’m hoping to keep it under 10k. We’ll see. The prologue is all about Sachi, and it has to be, because she’s going to die at the end of it. In the upper right hand corner, we have a card titled “Sachi’s Letter”. This isn’t actually an entire portion in the book, it’s going to be split up and each section will go with a corresponding section of Taphim & Zareja’s story. I’ll admit, I’ve kind of cheated. I’ve already written about the first 500 words of the prologue, and I’ve completely written Sachi’s letter. I won’t count those parts in my NaNo word count next month. But sometimes, you have to write it down before you forget it. Let’s skip down to the second row . . .
From left to right, we see two cards labeled “Present” and “Past”. This is the new thing I’m trying – there are things we need to know about Taphim & Zareja that happen long before Taphim falls in love with Sachi. There are some choices that both of them make that are directly influencing everything that happens post-Sachi. If you look at the full-size picture, you can see the numbers notated to the right of each section of “Sachi’s Letter”, and there are corresponding numbers in the upper right hand corner of each “Past/Present” card. These are just notations for me to keep track of the chronology of the plot. It is not mandatory to do it this way, this is just the way it works for my brain. Like I said, the beauty of index card outlines is their versatility. Put down what you need to for you to remember what needs to happen in the story. You don’t have to copy my methods (though you’re more than welcome to if it will help you), and you don’t have to copy anyone else’s methods either. And on a side note, I have a Pinterest board devoted to the Undoing Chronicles, so if you want a glimpse into what Zareja’s world is like (because she’s been dominating the board XD), you can find that here. Also, thank you to kirileefeyhycanth for whipping up this awesome cover for me to put on my NaNo profile.